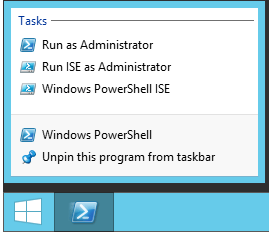 When you are working with PowerShell in your daily work it might be worth considering pinning PowerShell to the taskbar. By doing this you have easy access using either the the mouse of the keyboard hotkeys. Using these key combinations allows you to access PowerShell faster and no mouse-clicking will be required anymore. This entry was posted in PowerShell, QuickTip and tagged Hotkeys, Links, Pinned Icon, PowerShell, Taskbar on 2015-06-24 by Jaap Brasser.